Grant Harley’s first love was caves. Trees weren’t exactly on his mind as he studied the implications and ownership of caves in west-central Florida as a graduate student at the University of South Florida. It wasn’t until he attended a lecture on tree rings, essentially as a curiosity, while pursuing his doctorate at the University of Tennessee that Harley’s thinking about trees piqued. He was immediately hooked and soon his whole research focus switched. From the ring of a tree, Harley could not only find out its age but also analyze the effects of climate change by the trauma it suffered at the hands of fire, hurricane or drought. Harley wrote his dissertation on tree growth dynamics of a specific variety of pine in the Florida Keys, their fire history and that fire history’s relationship to climate. It’s a field of study with lots of untapped potential in his home region along the Gulf of Mexico, and throughout the drought-prone alpine forests of the West. His research on trees that have survived hurricanes took Harley and others at the University of Southern Mississippi to investigate the Underwater Forest, a cypress grove buried deep in the Gulf of Mexico that Hurricane Ivan uncovered in 2004. Based on their research, Harley and his team determined the ancient trees were preserved 50,000-75,000 years ago. “Most of them died in the same year. I don’t know, it could have been a hurricane and it could have been sea level rise,” he said. 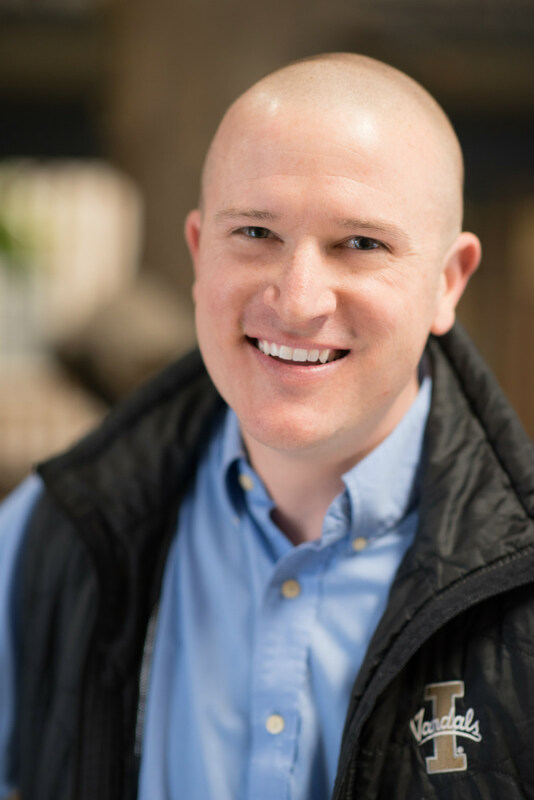 Harley, who spent much of his early career in the Southeast United States and hails from central Florida, had already aided on projects across the West when he came to U of I and Moscow in 2017. From forest fires and drought that damage groves throughout the West to snowpack problems in the Cascades, Harley has taken on myriad research opportunities since arriving at U of I. 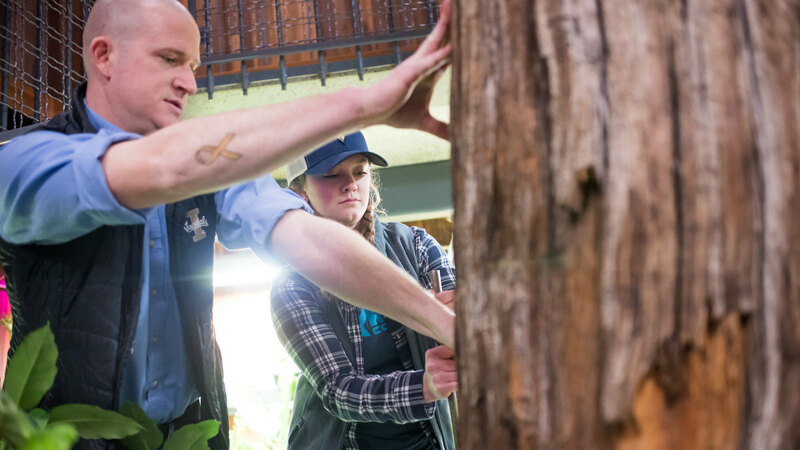 Grant Harley, assistant professor in the Department of Geography of the College of Science, works with students to “core” the snag in the College of Natural Resources building on the University of Idaho campus in an attempt to determine its age. He’s even recruited his undergraduate students to help date the fossilized snag that serves as the centerpiece of the College of Natural Resources building on U of I’s Moscow campus. Using a hand-held increment boring device, Daniel King, Emily Mangini and Claire Cantrell took core samples of the famed tree and are helping corroborate its age with other existing data. The project has spun off into others as Harley has already recruited additional students in his research lab who can help clients like the U.S. Forest Service age trees on their parcels and help provide data to fuel future student research projects. From the varying sizes and shapes of their rings, the growing tree trunks collect bark and moss, and serve as their own monitoring devices that can help dendrochronology experts like Harley analyze insect outbreaks, drought, fire and snowpack for millennia to come. “It’s essentially a thermometer and recording device for anything that happens in the environment,” he said. But dendrochronology is a small field. Harley’s closest counterpart at the U.S. Forest Service in Montana is getting close to retirement, leaving his closest direct collaborators in northern Utah and western Washington. That might be why his research opportunities seem to multiply by the day. Harley recently took a call from a colleague who asked if he wanted to look at some 1,000-year-old alpine larch, which can be especially sensitive to temperature changes. He’s started a lab with faculty members in the College of Natural Resources interested in addressing some of these environmental questions. Harley, Mark Kimsey and Eva Strand have reserved space in the Integrated Research and Innovation Center at Moscow for the Idaho Tree Ring Lab (I Core), which will accept tree samples from industry experts and government clients. And in the Inland Northwest, the inventory of trees to examine doesn’t appear to be slowing down any time soon.